Today I had the pleasure of assisting with a cooperative TNR event, in Gold Bar, Washington, which is an old mining town in the foothills of the Cascade Mountains. Mining towns have a history of being kind of rough-and-tumble. Well, even though Gold Bar probably hasn't had any active mining in nearly forever, it hasn't lost it hard edge. 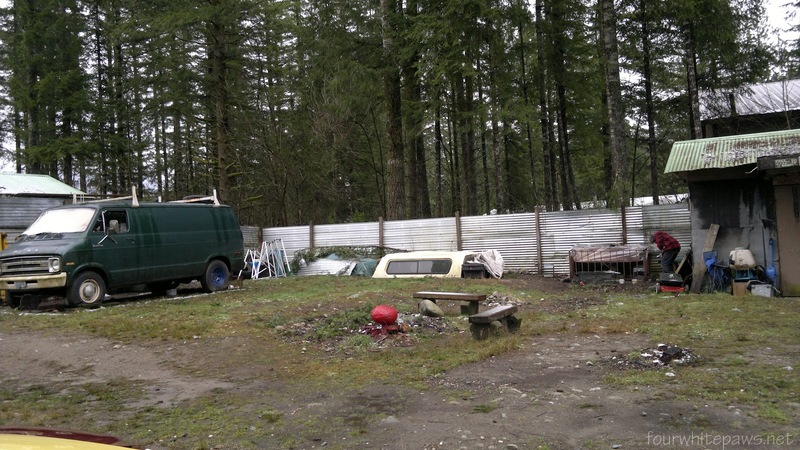 The trapping site consisted of a sizable piece of property with a few well weathered structures and a number of old motor homes parked around. By the look of things, I'm guessing that any structure which could have possibly housed people was all filled to capacity with human inhabitants. There were also a number of old vehicles around, their glory days long gone and a variety of miscellaneous items strewn about. In these parts, there is a high probability that the folks living in these conditions are also using heavy duty mind altering substances of all sorts. You may need to click on the image to biggify it to see the traps. The weather called for off and on snow and rain showers throughout the day. The fresh dusting of snow on the ground melted away as the way progressed. The TNR team consisted of two of us newbies, where this was our first real trapping event, one somewhat experienced trapper and our team leader, Nancy, who is a TNR expert. (Nancy is the one who greatly assisted me on trapping of Oliver's family). A photographer from the local newspaper also joined us, apparently the newspaper will be running a story on our grassroots TNR group, Community Cats Coalition. I might end up being famous! Our goal was to trap 15 feral cats, 20 if we were lucky. The colony's caretaker is trusted by the cats, so she assisted with the setting up of the traps and had been feeding them in the traps for over a week prior. She lives onsite and wants the best for the cats. The plan was that when we got there, we would bait and set the traps then retreat to the vehicles while the resident caretaker would call out to the cats like the Pied Piper. The cats would immediately swarm her and quickly make their way into the traps. Our team leader noted she witnessed this happen last week when she visited the site earlier. This was gonna be easy, so we all thought. I had three personal goals for this event. I wanted to learn more about how to trap in a larger scale site, I wanted to get to know more cat-loving people and I wanted to see if trapping cats that I didn't have a relationship with would be emotionally easier than my experience trapping Oliver and his family. So, when we arrived, we were not greeted by the cat-friendly lady as planned, but rather an extremely belligerent and angry man who screamed at us to take the traps and go away (he used much more colorful language). He went on to say he was going to just shoot all the cats and be done with it. While he was going on and on, the cat-friendly colony caretaker woman was no where to be found. We learned that she would not be making an appearance. There did happen to be a few other people milling about who tried to calm the guy down, but to no avail. Someone said that the belligerent man had a gun, but he probably wouldn't use it - oh joy! The decision was made that we would continue going forward, the plan must go on! I made a mental note that next cooperative trapping I go on, I'm getting a bullet-proof vest- yikes! We hastily went about setting and baiting all 24 traps that were scattered across the property. In an instant I forgot everything I had learned about how to set traps as I was so freaked about getting shot by the angry cat-hating violent man, whose property we were now trespassing on (he had demanded we leave). It wasn't until later, when I was sitting in the car watching for cats, that I realized I hadn't put the bait in the right spot (it goes behind the trip plate rather than on the trip plate) and I hadn't checked to see if the traps were on stable ground (not wobbly). Gosh, on one trap, I didn't even realize the back door was folded in, so the cat could freely escape! Without the colony-caretaker to call the cats out, we were stuck waiting and watching. Slowly, one or two would meander out and make their way into the traps. After four hours we had managed to trap only 7 feral cats. Thankfully, the caretaker-lady finally made an appearance. She apologized for not coming sooner and noted her man was so angry earlier that she didn't dare cross him. She asked us to leave for a while, she thought our presence and the strange vehicles were keeping the cats from coming out. So, we took off for a late lunch. I decided to head out after lunch, so I missed the last bit of fun. I just heard from Nancy that the grand total for the day was 12 trapped cats and plans were made for trying to get the remaining cats. I'm excited for the next opportunity to help out some more feral cats! And it feels good knowing I helped these precious cats today, it's not their fault they live near such crazy humans. Thanks to Nancy and Jenny for organizing this event! I look forward to helping more ferals in the future. Wow, Phil, well done! It's unfortunate that obnoxious and violent man interfered. I wonder if he abuses the woman who's caring for the colony. Ugh. But 12 is good, fingers crossed for trapping the remaining ones too. I want to wish you well with your rescuing of the feral cats. I have a special place in my heart for ferals... 'cause I was one before getting my peeps. What a wonderful you and your friends are doing. Wow, you were risking life and limb! It's ultimately good for the cats, but you do need to watch out for the scary humans!! It is sad that people are not more open to receiving such help, but good for you and your team to help the kitties. Hopefully the next time you are out you don't feel the need for a vest.. I'm so glad you were able to help. This is a great thing to do, try to help these feral cats...ignore the crazy man with a gun! Easier said then done right! YIKES! Talk about "excitement"...I'm glad nobody was hurt and 12 cats will no longer have kittens. But what a way to start! Well, things can only get better! That is simply terrific Phil!